Linked to Tip Me Tuesday on Tip Junkie. Beautiful layout! Lovely flowers!!! I adore how you used the negative letter stickers! Wowwwwwwwwwwww! This is BEAUTIFUL!! I loveeeeeeee the photos and that title work...and you design is perfect!!! Beautiful, Lisa!!! Love those flowers and your work!!! BEautiful flowers...you must have a green thumb! Great page! Well aren't you so clever! I'll have to try that with my alpha stickers! Great LO, too! looove your title, you ran out of stickers for the best!! so you pretty. love the colors. 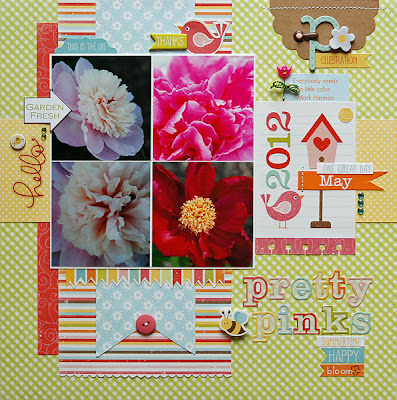 Beautiful page and what a great use of those stickers! Absolutely awesome layout! I really love the way you did the title! That looks SO GOOD! Gorgeous flowers! And you've showcased them beautifully with your design. Love the title - very clever. The little birdies are such cute accents. I love your grid of flowers. They are so pretty. Great design, as usual. I love seeing how you put things together. I see you did you the birdie journaling card. :) Great tip about the alphas. I should do that with my sheet. I already know I will run out of the letters I want! !